Fr John Larsen, Superior General of the Society of Mary, talking to New Zealand Marists. 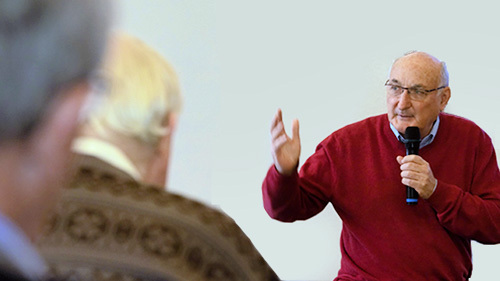 The Marist approach to mission is universal. At home or abroad, it does not matter, the Superior General of the Society of Mary, Fr John Larsen told New Zealand Marists. “It’s not about the geography of the map, but the geography of the heart”, he said, drawing on his mission experience on foreign shores. Mission is an attitude of heart, because people on mission leave their comfort zone and, as it were, ‘cross the road’ to where it is less comfortable, to help give life and encouragement. In this sense, foreign mission is akin to the mission at home, he said. Drawing on the decisions of the 2017 General Chapter, Fr Larsen developed an analogy between going on mission and ‘crossing the road’. It does not matter whether ‘crossing the road’ takes Marists to another country or culture or whether they remain in their own country and culture, the point is wherever Marists are on mission they need to ‘cross the road. For example: be among different customs, a different approach to life, be disadvantaged, view the world differently or have an unfamiliar understanding of church, he said. Regardless of where people undertake mission, Marists on mission, are, as it were, in a ‘foreign’ land and are there to help the people, giving them life and hope, he said. Fr Larsen elaborated on his mission theme by suggesting that in a sense a Marist on mission is like an ideal dinner guest; is sensitive, away from their home comfort-zone, respectful, knows when to contribute to the conversation and when to leave. Talking about Marists on mission presupposes a willing and able human resource. Fr Larsen sees the changing world and the declining demographics inside the Society of Mary as an “opportunity” and not cause for panic. As superior general, globally he continues to look for new opportunities for the Society. He told the gathering, “The future will be different, and we need to re-shape our mission for the future; there’s no going back”. Fr Larsen identified discernment and the call to deep prayer as crucial in these times, putting the question to Marists, ‘what is the Lord asking of us now’. “Don’t go to the textbook, there’s no answer there”, he warned. Calling on his time as mission director at the Marist mission in southern Thailand, Fr Larsen reflected that when first in Ranong the Marist team working with Burmese did not know what to do. For example, “Do we as Christians in this foreign land put up our crucifix in classrooms”? “Do we pray with the Burmese in the Christian tradition, or do we bring in the Buddhists”? He said the Marist team decided that key to working with the local people was to stand with them, to help them answer some of their needs; to bring them hope and they did this, for example, by helping them with their education, teaching them English, helping them get proper health care. Fr Larsen said from the very start working alongside lay people was a cricical element of their new mission in Ranong. Lay people were even part of the scoping operation, he said. The superior general said that more and more the Work of Mary means working with lay collaborators. Pragmatically, “We need a working relationship”, the superior general said. On the final morning, Fr Larsen looked ahead 30 years and initiated discussion around possible new ways the Society can structure itself in order to help accommodate the global Marist mission. Fr Larsen was in the country for two meetings, each over three days, one in Auckland and the other in Wellington. He was here to focus Marist priests and brothers on the future of the Society in New Zealand and around the world. Fr Larsen, by birth a New Zealander is a member of the Marist Asia province. After ordination he taught in New Zealand for five years before spending the next 30 years in The Philippines, Thailand and Burma, before becoming the Director of the International Marist seminary in Rome and then Superior General. 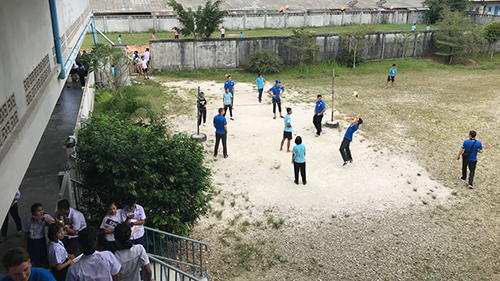 Volleyball during a break from class. Eight Year 13 students from St Patrick’s College Wellington will spend part of their 2019 summer holidays at the Marist Mission in Ranong, Southern Thailand. The students will help Burmese refugees in Ranong, Thailand, learn English. The journey follows a similar one in January 2018. “It’s going to be a great opportunity to open my mind and see how other families in the world live,” says student William Ross. Fellow student Sam Aldridge says he is looking forward to helping out people that are way less fortunate. “I’m up for the challenge”, he says. According to the College’s Fr Matthew Crawford SM, the trip has the dual purpose, giving the St Patrick’s students an experience of how others with few material resources make the most of what they have got, and secondly to contribute some much needed English speaking teachers to help the Burmese refugee students. “Knowing English is the single most important way for these students to break the cycle of poverty”, says Fr Frank Bird SM of the Marist Asia Foundation. “If the St Patrick’s College students are able to help in some small way in that educational journey, the trip will be a resounding success”, says Matthew Crawford. Matthew Crawford says the feedback from earlier trips is the St Patrick’s students find it very moving to visit the homes of some of the students they teach. It is “a real eye-opener”, Matthew Crawford says. In between studying for their exams, the eight students are busy fundraising for the venture. A minor mid-life crisis led Fr Frank Bird to Ranong, on the Thai-Burma border, where he found new purpose in life. He was 40 at the time, and working in one of the New Zealand Marist province’s priority missions in Okaihau. “I was getting too comfortable,” he told the Wellingtonian newspaper. He said he could have continued his education work with children in the north of New Zealand and watch TV every night, but thought he had more to offer. Fr Bird has worked with the Marist Asia Foundation for three years and was back in Wellington recently to visit the Foundation’s supporters. There are 140,000 migrants living on the Thai-Burma border and the Marist Asia Foundation’s three priests and 15 local staff run three education programmes, pre-school, secondary and online university through the ACU. Fr Bird says that with poverty such a major problem, immigrant workers are likely to get what he calls “3D” jobs; difficult, dangerous or dirty, but that education provides hope. Fr Bird thinks the Marist Asia Foundation is making a difference. And he observes, that each year of secondary education improves their future chanced by around 10%, but alas few get the chance. Ranong is a fishing village where prostitution is common. Prostitution goes hand in hand with HIV/AIDS. “They avoid being tested and carry on as if they haven’t got it,” Fr Bird told the Wellingtonian. The Marist Asia Foundation works hard in the community to help people with HIV/AIDS. As well as regular visits to people suffering from HIV/AIDS, the Foundation puts translators in into the hospitals to teach people about HIV. For those at home and who cannot read and write, the Foundation workers, for example, draw a Sun on the calendar to remind them to take a tablet in the morning. Bird says that working with the Marist Asia Foundation has changed him inside. It’s a bit like Jesus in the gospel of John taking off his ‘priestly garments’ and picking up a ‘towel and water basin’ to wash dirty feet; moving from the ordered priestly workbench of the altar to more dirty missionary pathways and streets, he said. “I’ve never been happier,” said Fr Bird.